2001. Acrylic on stretched canvas. 18"x24". Merope, known as the "Lost Pleiad", gazes skyward at the Pleiades star cluster. 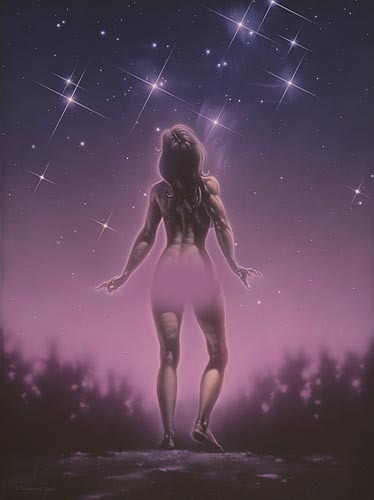 The Pleiades were the "Seven Sisters" of ancient Greek mythology. According to legend they all married immortal gods except Merope, who was wed to the King of Corinth. The Pleiades is the best-known galactic cluster in the heavens and is named in honor of Merope and her sisters.